One of the new members of Generation Next from the worm casa, next to an elder (maybe its mommy, maybe its daddy?). 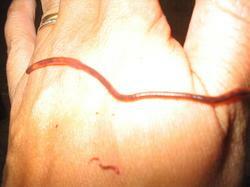 Sorry for the lousy photo...baby worm's way out of focus, but this was a case where prolonged observation would not have been good for the health of the observed...and you thought toddlers were squirmy. 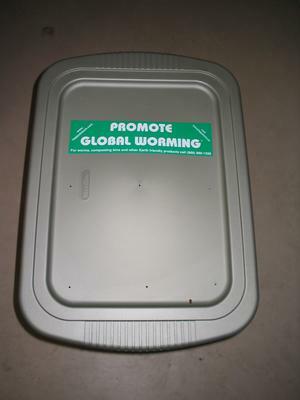 Here's my worm bin. There are drainage/ventilation holes drilled at the bottom, sides and lid. The bin rests on four wooden blocks (really, my kids won't miss them) near the sump drain in our heated basement, but so far, no leakage. The bedding in the bin is corrugated cardboard. I soaked the cardboard in water, squeezed out the excess water, shredded the cardboard by hand into 1" strips, then fluffed the strips for aeration before placing them in the bin. 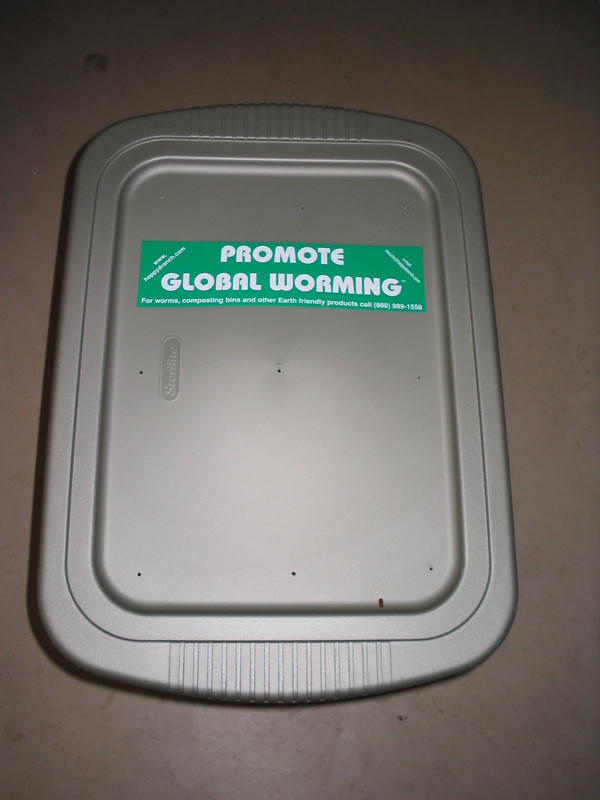 I started out with two pounds of red wigglers from Happy D Ranch, who also provided the pictured "Promote Global Worming" bumper sticker. I've been feeding the worms coffee grounds, crushed eggshells, lettuce, apple peels and cores, and lots of seeping bananas and banana peels. It's been about three weeks since getting started with the worms, and I suppose I finally feel that I won't be jinxing their very survival by posting about them. The moisture level in the bin seems to have reached a nice equilibrium, the bin smells like...garden!..., and this morning, I found two itty-bitty, squirming, white baby worms. Oh, and there are castings everywhere. (It's a good thing.™) I highly recommend the worm and vermicomposting forums at WormDigest and GardenWeb as a great source of information and support...especially for "newbies" like me. I've really enjoyed reading Amy Stewart's new book, The Earth Moved: On the Remarkable Achievements of Earthworms. There's something here for just about everyone. Even if you do not care one whit about earthworms, you'll enjoy her graceful and fluid writing. If you are a would-be Thoreau, pondering the mysteries of existence, the material world and our place in it all, the themes of this book will strike a reverberating chord. If you are curious about earthworms, you'll be amazed at how much information you will absorb—painlessly—about their lives and their world. And if you are predisposed to regard earthworms with affection, you just might find yourself, as I did a few days ago, welcoming a parcel from the postman, courtesy of Happy D Ranch, containing two pounds of real, live Eisenia fetida, the red wiggler. I especially like how this book points the way to Big Questions with No Easy Answers, in a clear, personable and unpretentious voice. (How much can we say that we really know, when there are phenomena that are impossible for us to investigate? How do we regard the success of a "good" species which comes at the destruction of other "good" species?) I'll value this book for fermenting my thoughts about questions like these long after I've put it down. The Earth Moved: On the Remarkable Achievements of Earthworms. Amy Stewart. Algonquin Books of Chapel Hill, 2004. ISBN 1-56512-337-9.